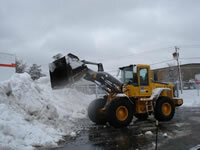 Tompkins can provide snow plowing and ice management services to commercial clients throughout Andover and North Andover, Massachusetts, the Merrimack Valley area and the greater Salem and Southern NH area. We provide exceptional service to all types of commercial properties including condominiums and apartment complexes, retail plazas, gas stations, restaurants, banks, office buildings, industrial properties, healthcare facilities and churches. It is our goal to make sure your residents, employees, customers and suppliers are safe at all times. Tompkins Corporation provides salting and de-icing agents as part of our complete winter solutions for both residential and commercial areas. 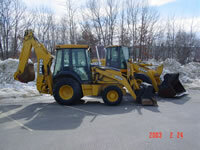 Our first priority is to maintain safe parking lots and walkways. We provide all of our customers with consistent quality service. Prior to commencing work, our team members visit the site and inspect the designated areas in order to provide you with the best service possible. We plan well ahead in order to determine the appropriate de-icing, salting, and other melting agents to use for your specific areas. After snow plowing, hauling, and relocation, many areas, both commercial and residential, can be quite slippery from wet snow and ice.